In October of 2016, Judy Carroll visited Sydney, NSW, in the company of her fellow star-worker, Helene. They take the opportunity to visit Kariong and see the Grandmother Tree and the various hieroglyphs located at Kariong. Judy Carroll shares what emerges as a rite-of-passage gifted to herself and fellow star-worker Helene from the Indigenous beings residing there in the interdimensional portals. On the weekend of the 1st and 2nd of October, 2016, Helene and I were scheduled to speak at a UFO research group in Sydney, New South Wales, Australia, run by Mariana Flynn. It was our second visit to this group; we’d spoken there in 2013 and had been well-received, so we were looking forward to another visit, and to connect with Mariana again. Two star seeds from the United States, Althea Provost and Karen Restom were joining us, and for Helene and myself, our presentation was to be focused on speaking out openly as Greys. I finished my talk by reading out the Lord’s Prayer, with the lines of the modern version followed by the same line of the Aramaic version, to illustrate how misinterpretation of this ancient language spoken by Jesus and the twelve Apostles has clouded their all-important message of peace, love and oneness for the past 2,000 years. A panel discussion followed, with a question and answer format, to encourage active inter-species communication. Helene (Ka Li Yah) finished the evening off by guiding everyone through a meditation that had been given to her by our Grey star family. This meditation is specifically designed to assist the healing and activation of the Earth human chakra system and DNA in order to awaken deeper and expanded levels of conscious awareness, which in turn will help people to connect more fully into higher frequencies of unconditional love and Oneness – humanity’s path home to God/Source. Many star beings were present in the room throughout the meeting as all of us spoke. Helene had been working on this healing project all year, receiving downloads of information and instruction from a Grey Elder, and some weeks earlier she’d received very tangible proof in the form of 2 beams of white light that came down onto the hood of her car while she was out driving one day. Luckily she was able to pull over quickly and her phone was handy on the seat next to her, enabling her to capture the image on film. When she later magnified it, a DNA-like spiral became visible on the lower end of one of the light beams. The beams came down out of a huge white light above the car (somebody who looked at the photo said that they could see an ET ship there). A number of orbs are also visible. On the second day of our visit – Sunday 2nd of October – we caught the train to Woy Woy, near Gosford, NSW, to meet up with our guide, Nina, who was to take us to the Kariong Glyphs. Even before this trip was planned, I’d had a dream about visiting the area, in which we travelled through 2 portals, and entered a narrow gorge where hieroglyphs were carved on 2 walls. I was shown that Helene had been one of the artists who’d carved these symbols. This was a good indication that our visit was going to be an extremely significant experience for both of us, but especially for Helene. Nina met us at the train station and the three of us headed out. 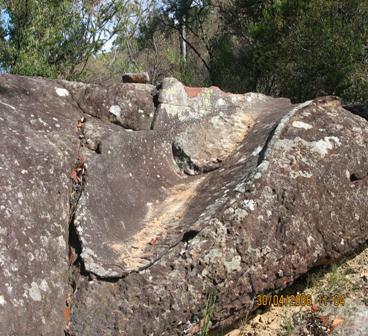 The first site, Bulgandry Aboriginal Site, is on the closest ridge to the north of the Kariong glyph site, and it provides an important pointer to the other site. The Bulgandry site is dedicated to Baime, the first Creation Spirit of Aboriginal lore. 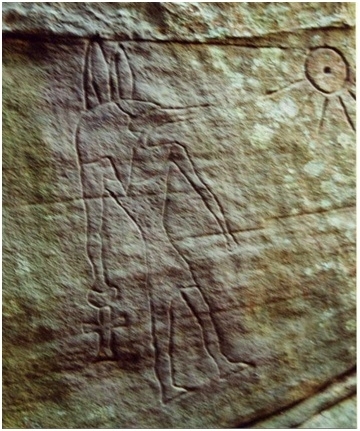 On the top of the ridge is a rock platform on which there is an engraving of Baime, with one of his arms pointing directly towards the Kariong glyphs. The legend explains that, right back at the beginning, after the animals of Earth had been created, there were no people, so Baime, the first Creation Sky-Hero, decided to make the human species, but these human creations quarrelled, fought and showed no respect, so Baime wanted to destroy them, but his feminine counterpart objected, pointing out that the humans needed guidance. Baime has no gender, but this original Creator Spirit appeared in male form and presented the wisdom of the ages to humanity. In Aboriginal lore this wisdom is known as the Dreaming. Baime is acknowledged at this site as Key Creator, with the land animals he’d created engraved on one side of him, and the sea creatures on his other side. Before entering this very sacred area, we paused for a short ceremony to honor the Guardian Creator Beings and to ask permission to enter. Nina, our guide, has undergone many years of training under a highly respected Aboriginal Elder known as “Aunty” Beve. Aunty and Uncle are terms of respect for elders that are used among the Australian Aboriginal people. This Wise Woman has transitioned since passing on the sacred lore to Nina, but she is always present in spirit when Nina carries out this work, so we took a moment to honour her as well before entering the site, and each of us carried a white Cockatoo feather, to honour Aunty Beve’s clan. We spent some time walking around the perimeter of the rock platform, inspecting the beautifully carved figures, then back to the car to proceed to Kariong. As Valerie Barrow describes in detail in her Alcheringa book, Kariong is the site where the smaller ET “rescue pod” finally crashed into the ocean after it was ejected when the Pleiadian Mothership Rexegena was attacked and blown up. Only 90 people out of 50,000 survived this attack. Again we paused for an honouring and permission ceremony before entering this area. Little did we know then what a Quest this was going to be! Luckily the weather was reasonably cool still, as our visit began with a very long walk through the Bush. We took our time, stopping often to photograph beautiful wild flowers along the way, including Grey Spider flower and Bush Fuchsia. Helene is a practitioner of Australian Bush Flower therapy, and she took photos of these two plants. It was only after we returned home and she was able to check out their healing properties that she fully realised the significance of them appearing on our path. Grey Spider flower, which she photographed on the way in to the glyphs, is used to help release deep fears and terror, and to assist with faith, calm and courage. Bush Fuchsia, photographed on our way out after successfully completing our Quest, represents intuition, clarity of speech and integration of information. Given the experiences we were about to go through, the appropriateness of this was truly amazing! The area is also thick with “scribbly Gums.” These are beautiful, slender trees with light-coloured bark decorated with the artwork of a small burrowing creature. Some of these “scribbles” were amazing, closely resembling human-looking figures and faces, and other creatures including a seahorse. Faces can also be seen in the rocks, as we observed on our visit to Uluru, underlining the Aboriginal belief that the spirits of the Ancestor/Creator Being took up residence in the landscape, where they remain to this day as Guardians. 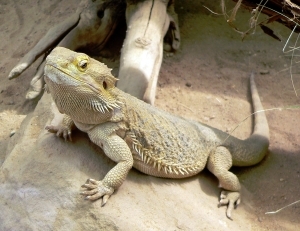 We hadn’t gone far when we were confronted by a small bearded dragon lizard standing boldly facing us right in the middle of the path – obviously a gate-keeper, who graciously moved aside to allow us to pass. The next gate-keeper was a giant swarm of native bees filling the entire path with a massive, loudly buzzing cloud. As we approached they too parted, allowing us passage. The third “wonder” we encountered was a magnificent lilac Wisteria flourishing in the depths of the Australian Bush, untended and wild, in full flower. Totally bizarre! Wisteria represents openness, nurturing, creativity and gentleness – the yin side of Creator Energy, and very much symbolic of my Grey sister Helene/Ka Li Yah! 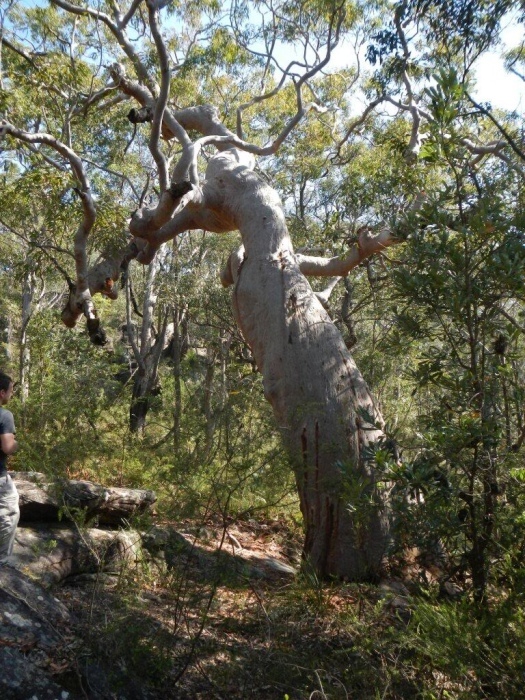 After what seemed like miles of walking, we arrived at the Grandmother Tree – a massive Angophora tree which embodies a highly-respected female Elder/Creator Spirit who guards the entry into the narrow gorge containing the Pleiadian and Egyptian glyphs. We paused to rest and to honour Her before continuing up to the site. Spiritual quests are never easy. Their whole purpose is to present a challenge designed to strip one’s mind back to bare bone in order to reveal the shining diamond of the pure Soul Essence within. Having been through such an experience myself, I knew it was Helene/Ka Li Yah’s turn, for which she’d been preparing all year. It was to be a major Rite of Passage for her. My “Grey sister” does not like hard physical exercise. She’s a hard and dedicated worker, but is not into deliberately putting her body through strenuous exercise (very sensible of her!). She’s the epitome of the Earth Mother, is Mum to 2 beautiful star children down here in physical form, and is a Carer to many hybrid children up on our ship. To all those Earth mums out there who are aware of having given birth to hybrid babies and who feel distraught because their little ones have to remain on board ship to be raised and cared for, please be assured that with Helene/Ka Li Yah in charge (she’s a doctor on board ship), they’re well-cared for and loved to bits. Grey babies may seem listless to human eyes, but this is because all their focus is on Mind rather than on physicality. They simply don’t need the practice of crawling, rolling about and physical activity that Earth human babies require – and their Grey carer, Ka Li Yah, isn’t too keen either! Our Quest began deceptively easily, presenting us with a slight uphill ascent which involved climbing up over some smallish rocks. I was carrying our supplies in a backpack, to leave my hands free for pulling myself up using rocks and trees as hand-holds. As we progressed there was a subtle change in the energy, and then our first challenge appeared in the form of an extremely small opening which we had to climb up to, then bending double, had to squeeze ourselves through. A sense of protectiveness and déjà vu came over me, urging me to allow the others to go first, to make sure they made it through safely, but Helene held back, insisting that I go ahead of her. This sense of “been there, done that” was weird, because I’ve never quite related personally to the Pleiadian ship crash way back then (900,000 years ago). Maybe my physical body had died in the crash, but I’d remained with the group in spirit, to try to protect them (???). I could see Helene was worried about whether she could do this or not, but we both knew that she HAD to! She had no choice in the matter. Once Nina and I were safely through, we encouraged our “crew mate” to crawl hand over hand through the tiny opening, which is barely 2 feet in width and height. Once through that, the second challenge was a massive scramble up and around through another smallish opening to reach the narrow gorge where the hieroglyphs are situated, Pleiadian on the left, Egyptian on the right. By this time we were starting to really struggle with the same feelings of exhaustion that Valerie Barrow describes the marooned ETs as suffering – fighting for breath, physical weakness and uncertainty as to whether we could make it, or not. But there was no choice – we HAD to make this final ascent! Greys are not into physicality, and the Grey energy that Helene and I carry in our makeup affect us both, but in different ways. For me it’s the fixed lower jaw. Greys cannot open their mouths as their lower jaw isn’t hinged as in an Earth human body. I’ve had problems with this all my life and have received healing from the Grey Elders for many years to assist me to be able to speak out clearly, as my job down here is to be a Communicator. Anyone who has seen me speak at venues or on YouTube will have noticed a slight immobility around my mouth area, almost as if I’ve suffered a stroke, but I haven’t – it’s just the Grey part of my makeup affecting me. Greys also have trouble with physical mobility in the body, which is partly why I was advised to take up dancing and then Tai Chi. Many people taken onto our ships have noticed that we tend to float along above the ground, because our Grey “containers” can’t walk very well. This has affected Helene down here with a lifelong tightness in her calf muscles, which made this particular Rite of Passage particularly challenging for her. Such spiritual quests always are “tailor-made” to challenge us at the deepest levels of our being! Our guide Nina went first and I followed. There was no way I could get up with the heavy backpack on so I handed it up to Nina before crawling and pulling myself up, hand over hand, and scrabbling to find footholds in the almost sheer rock wall. It was an awkward climb that involved twists and turns and a final scramble over a sharpish lip of rock that was sticking up. Then it was Helene’s turn. It took her several minutes of preparation, of getting past the fear barrier and into the right “head space” to make this major ascent upwards, over and into the gorge, which took her probably another 5 minutes to accomplish, but to her it felt more like 15 minutes or more of prolonged pain and fear of not being able to make it. Such challenges really do return a person, Earth human, Grey, Pleiadian or whatever, right back to basics! It’s a very elemental experience, stripping away any pretensions of ego, pride or whatever, baring one’s soul to its naked and unadorned roots. For my Grey sister, Ka Li Yah, it was the biggest challenge of her present life. Nina and I just kept talking and encouraging her, and I kept putting Reiki symbols over her to give her strength and courage. It was not only a physical challenge but an emotional and spiritual one as well, because as she neared the top, the very first thing she saw was an engraving of an ET ship – an engraving she had done herself all those millennia ago. Gasping for breath, shaking with exhaustion and with sobs coming from deep within, she fell forward to place her hands on it. It was as if she was re-living all the pain from the past, processing, healing and clearing it from the depths of her soul. After allowing her the time and space she needed, Nina then led us up through the gorge towards a rock ledge from where could be seen the area of the ocean where the rescue pod had crash landed, but challenges always come in threes. There was still one more barrier to be surmounted in the form of a rock wall as high as our heads or more, with no footholds and slightly concave so we couldn’t crawl up it. Shaken and exhausted as she was, Ka Li Yah, always the navigator, was determined to find a way, and suggested we wedge some rocks in halfway up to provide us with a step. Worried that they might give way with the weight of our bodies, I went first, figuring (and hoping) that my years of Tai Chi training would provide me with enough balance and agility to save myself if they did give way under me – but they worked well. We were soon up and over. Once up on the rocky ledge, we first looked out over the ocean to the area where the ship had come down. Nina then led us to a second vortex, the first one being situated just beyond the opening into the gorge. We later found that this first vortex had magically appeared by itself on Helene’s phone/camera between 2 photos she’d taken facing back to the entrance to the gorge. She’d taken the entrance photos in quick succession to record and celebrate her achievement, and no other photo was taken between them, but the vortex has shown up on film, sandwiched between the 2 she did take. The second vortex, after the gorge, is marked by 2 circles sitting side by side on bare rock. Helene and I sat down together, one of us in each, to meditate for a few moments. She “just happened” to glance at her watch and found it to be right on 12 noon – the exact time that I’d stood in the very centre of the sacred circle at the Rollright Stones in Oxfordshire, UK, in mid-June (the day of the Summer Solstice) in 1995, where my major Rite of Passage had taken place. The next moment we became aware of being encircled by a group of Aboriginal and ET people, moving slowly around us in an anti-clockwise circle, activating and sealing our Initiation. We went back to join Nina, who was very excited by an engraving of an arrow she’d found in the rock underfoot, pointing out to sea. In all the many times she’s brought visitors to this spot, she’d never noticed this arrow. A message came through that it pointed to the exact spot where the rescue pod had come down into the ocean. There was one more thing that she wanted to show us. This was a massive rock with a hollow carved out of the centre, known as the Birthing Stone. It’s believed that this stone was used by the ET females who were attempting through surrogate motherhood, to produce a more humanized hybrid species as an upgrade of the “mixture” species that the Draconians had been exploiting for slave labour. The ET females were attempting to carry these hybrid embryos in their own bodies, and the Birthing Stone was where they gave birth. The attempt was not successful, and caused major heartache to the ETs, whose whole reason for coming was to assist the new human species to evolve to a higher energy frequency through an infusion of their own off-planet genetics. With Helene’s very strong “Mother” energy, I did worry deep down how seeing this Stone would affect her after all the trials she’d already been through. Our Upstairs Family must have felt a similar concern! Nina has brought many visitors to this place, and the Birthing Stone is huge, but on the day of our visit she could not find it. She searched high and low, tramped all through the Bush where she knew it was located, but it had vanished into thin air. It was not meant to be, and I could tell that Helene too was relieved. Some memories are best left to recede. It was not necessary for her to see it. Our hybrid program is now going well, humanity on Earth is evolving, slowly but surely, failed attempts are in the past and are best left there. It’s now time to move on. Just to add a note on the Egyptian connection. Ancient Egyptians came to Kariong in reverence and on pilgrimages to give honour to this original place of learning and wisdom. 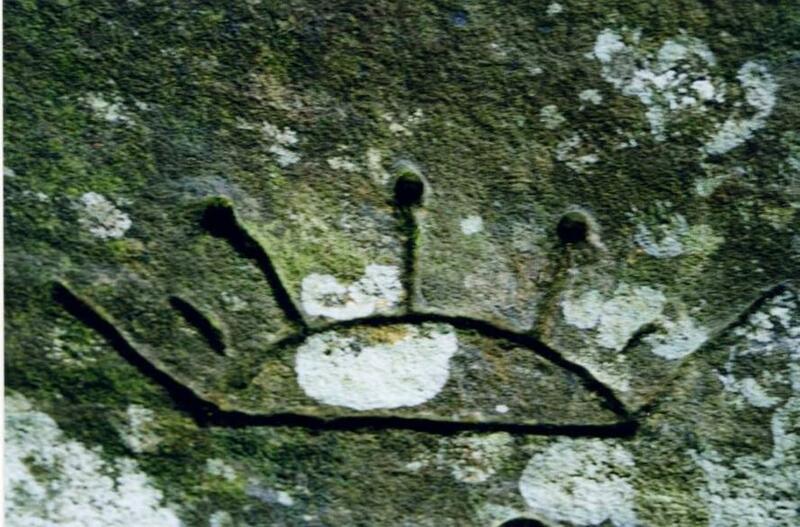 The oldest Egyptian hieroglyphs are right here in Australia; they engraved their own major deities and iconography in the gorge alongside the Pleiadian engravings. Back then they knew that this place was the sought-after “Garden of Eden,” where animal man became hu-man, genetically engineered from animal to human by the ETs who were trying to intervene after the hijacking of the planet by the first-born Repterran group who considered the planet as their possession to be exploited to the fullest, and the newly-developed “mixture” species as mere slaves to be used and abused. The Original People, the Aboriginals, have proto-Egyptian hieroglyphs in their languages, Egyptian hieroglyphs were originally based on Pleiadian hieroglyphs, and the similarities can be seen at Kariong.